Red versus Blue, not only is it the name of a great machinima series by Rooster Teeth, it is also the colors that represent AMD and Intel, the two primary PC CPU makers. For the longest time, Intel has been sitting upon it’s silicon throne as the proverbial CPU maker of choice for true members of the PC Master Race. All of that changed though on February 2017 when AMD finally released their new Zen Architecture line of CPUs named Ryzen. The first CPUs in this batch were the Ryzen 7 series of CPUs which featured eight-cores with 16 threads each thanks to Simultaneous Mulit-Threading (SMT) which is AMD’s version of Intel’s Hyperthreading. What this did to the PC market was finally for the first time since the early 2000s was provide competition in the market for mainstream PC builders. Well come August 10, 2017 (according to a post from WCCF Tech) AMD will bring the battle to Intel with their Ryzen Threadripper line of CPUs aimed at the High-End Desktop (HEDT) market! If you’ve been curious about what Threadripper is about this is your primer to start! Intel Slide Deck explaining what the current CPU families. For starters, I’m sure if you don’t know about it you are wondering what is a HEDT? Well the High-End Desktop market is usually aimed at professional workstations for content creators, designers, and enthusiast gamers who want the bleeding edge of technology. For the past few years this was primarily held by Intel with its X99 platform, and their Intel Broadwell-E and Haswell-E line of processors. 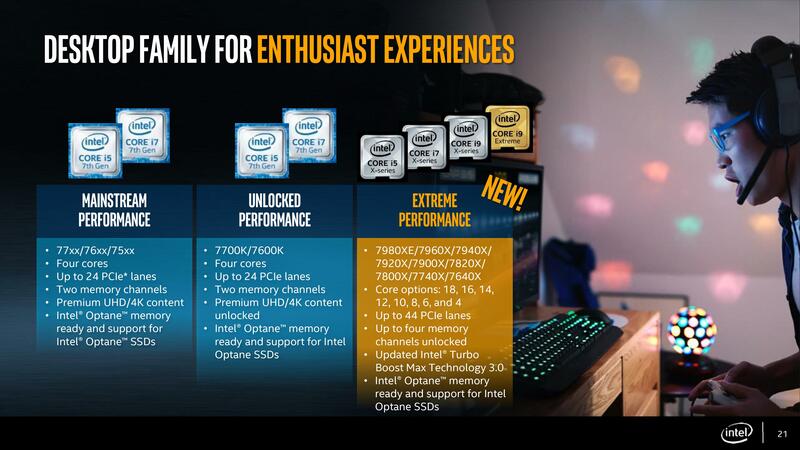 Earlier in June though at Computex 2017, Intel announced the successor to the X99 platform with X299 along with the Intel Kaby Lake X and Sky Lake X line of CPUs. This line of CPUs ranges from 10-cores with 20 threads all the way up to 18-core 36 threads at the top end. Unfortunately, if you just do a quick web search you’ll find many criticisms of how Intel launched it. One of the major sticking points is the confusion of how the X299 platform works depending on which CPU you pair with the motherboard (for more information check this video out from Linus Tech Tips). AMDs offering though is a little bit easier to understand though! Final release packing for the processors with Dr. Su, President and CEO, from AMD. On the X399 platform (it’s a one up to Intel just as you think) AMD has developed the new TR4 socket which will house for now either the Threadripper 1950X or 1920X processers. The X399 platform offers quad channel DDR4 memory along with blistering 64 lanes of PCI-E support for graphics cards and NVME based storage. For Threadripper the two processors that will be available upon the supposed August 10th launch is the 12/24 (Core/Threads) 1920X and the 16/32 1950X. The 1920X features a 3.5 GHz base clock with a boost clock of 4.0 GHz, while the 1950X features a 3.4 GHz base and a 4.0 GHz boost and both run on a 180 W TDP. Of course, just like most of the other Ryzen series of chips it also features over clocking capabilities out of the box. Plus unlike Intel’s line of chips the price point won’t be extremely expensive. The 1920X will be launching with an MSRP of $799, while the 1950X launches at $999 (all prices are in USD). Overall though the PC market is entering a great time in the PC market because we now have the choice and competition that we have not had in years. So, will you be Team Red or Team Blue? Bruce is your typical hard-working tech savvy all-around humble geeky gent, during his free time he builds Gundam model kits and also is the IT Director for our partners, GeekFactor Media.